At a press conference held on Thursday 23 September at the Yacht Club Punta del Este (YCPE), Uruguay, full support for the South American stopover of the Global Ocean Race 2011-12 (GOR) was confirmed by local groups and national government bodies. Concluding a six-day site visit to this popular and famous staging post for round the world yacht races, GOR Race Director, Josh Hall, formalised the extensive arrangements that are now in place for an extremely welcome stopover at the end of the double-handed circumnavigation’s tough Leg 3 from Wellington, New Zealand. 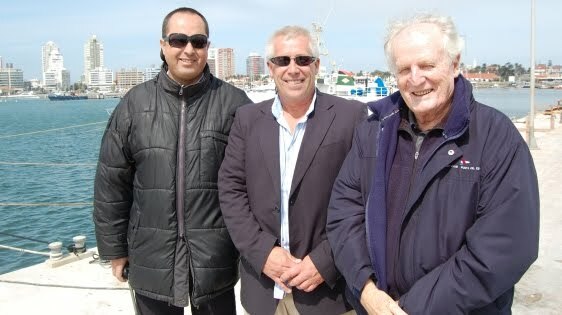 The event has been granted a status of National Importance by the Uruguayan Government and coupled with the full support of the Ministry of Tourism; The Uruguayan Navy; The Hydrographic Department; The Department of Maldonado; The City of Punta del Este and the Yacht Club Punta del Este, the month long stopover during March 2012 promises to be a highly successful return of round the world yacht racing to this stunning venue. With the Southern Ocean and Cape Horn behind them, the GOR sailors will receive a warm Uruguayan welcome in Punta del Este where excellent facilities for repairs and boat preparation can be utilised and the GOR teams can enjoy the stylish benefits offered by one of the world’s finest beach resorts. It is anticipated that a large entourage of family, friends and sponsors will take the opportunity to visit this unique destination during the race stopover and although March is just outside the city’s busy high-season, the fabulous weather of the Southern Hemisphere late-summer remains. In addition to their support of the GOR, all the parties involved have committed their practical support for the Global Vision Sailing Trust programme that will operate out of the YCPE throughout the stopover with up to 24 young people from the region undertaking an inspirational and educational experience each day.